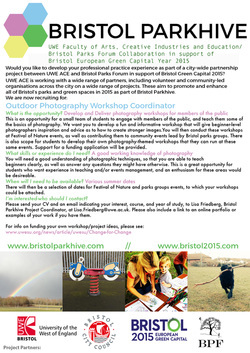 We are recruiting students who would like to develop their skills and experience through a project to devise and deliver/lead simple Photography workshops with individuals attending Community Events in Bristol’s Parks and Green Spaces in 2015. Some of these events will be part of Bristol’s Festival of Nature, and others will be contributions to community events being run by Friends Of/Action Groups working in Bristol’s Parks and Green Spaces throughout 2015. Workshops could focus on a wide range of themes (wildlife, plant-life, landscape, people) and will be at beginners/entry level. Workshops might - for example - include short introductions and/or formal technique/skills building information and then lead participants on walks around particular parks or green spaces which offer interesting photo opportunities that you may have identified in advance. This is a great opportunity for students to gain valuable experience organising and co-ordinating events, as well as experience of developing and delivering creative workshops in informal settings with people of all ages and abilities. 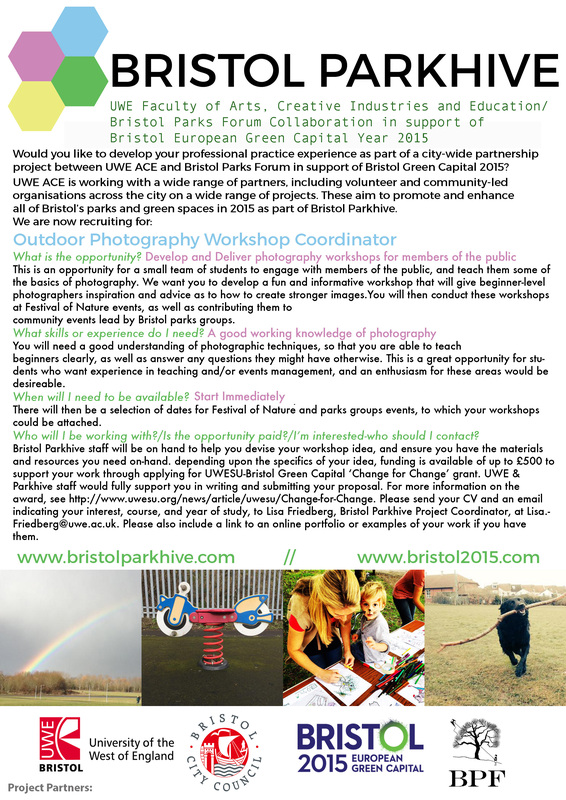 You will be supported by the Bristol Parkhive team who will be able to work with you to ensure that workshop materials and delivery are suitable for the events & that you have the skills, experience and confidence to deliver them - potentially working with a team of student volunteers.